The Gentleman Crafter: Christmas Fun! I had an amazing day with my amazing work family today at The Roaring Fork! It was our annual Christmas Lunch and I am so grateful for having these great ladies in my life. 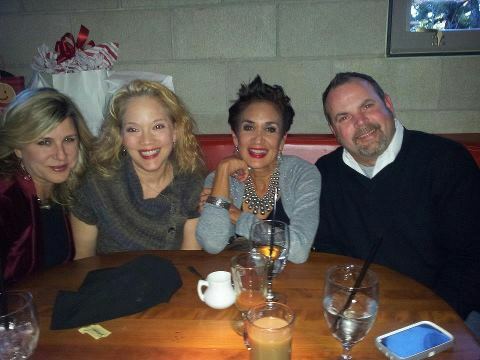 Thank You Pam, Cathy and Luna for making my day so special! NOW, I also want to thank you all for you're amazingly kind offers to send me Foundation Feet! You all Rock! Thank You Thank You! The Christmas Spirit is alive and well! Bless you all! 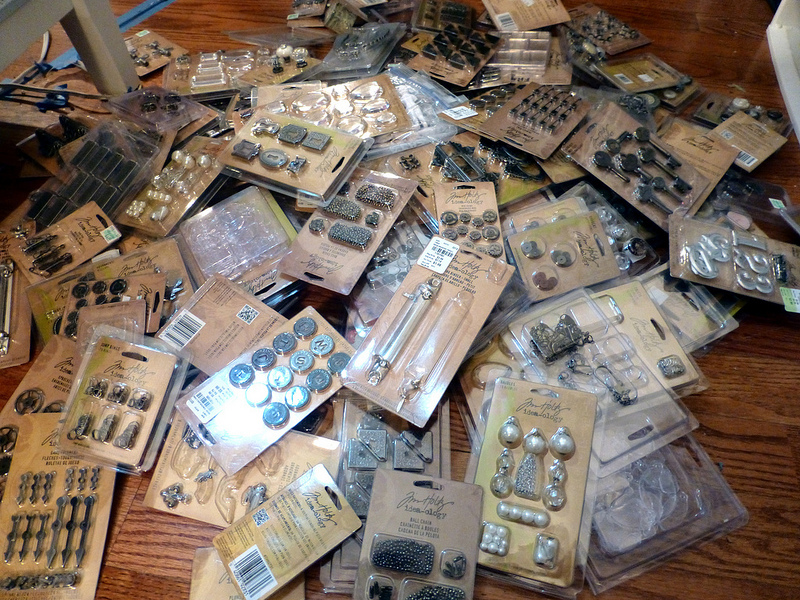 I actually did find a set of Foundation Feet in my stash, after of course I robbed two feet from another project. LOL! I did find some today in Austin and snatched both of the packages that were hanging on the hook. I felt so evil for taking the last two....for just a second! LOL! Tonight, I thought I would take a breather from the studio...I may regret this completely, but I absolutely MUST get my presents wrapped and ready to go to Brownwood for this weekend with the Fam! I hope my sister doesn't mind me making a temporary craft room out of her Dining room table. I need to get some Dylusioning done and I'm sure she won't mind getting her beautiful table misted with various shades of the BEAUTIFUL Dylusions Inks! Maybe she will read this post and it will help prime the pump! OK, Back to Christmas Fun...Now, in the picture I posted last night, I was having one of my "artistic temper tantrums." (not really a true tantrum, but I was a bit peeved...LOL!) so, I was on the floor in my studio going through my Tim Stash Boxes in total disbelief of not having any of the feet I knew I had to have! It was not until I picked everything up today that I actually found a package lying in the pile! How I was able to pick up a package and not realize what I had in my hand.... which means I had to touch the actual package and place it on the floor mind you... is beyond belief! Don't tell anyone about this! Old Jim is loosing it! OK, OK, The Fun....I love Where's Waldo....For those of you unaware who Waldo is, he is a drawn character that is somewhere in a very busy picture and you try to locate him. I love these! Well, the very FIRST person that emails me and sees the Foundation Feet lying in the pile will get one of my The Gentleman Crafter Logo Canvas Totes! What do you think? I was just blown away when I actually located them in the picture and saw them lying innocently there! LOL! 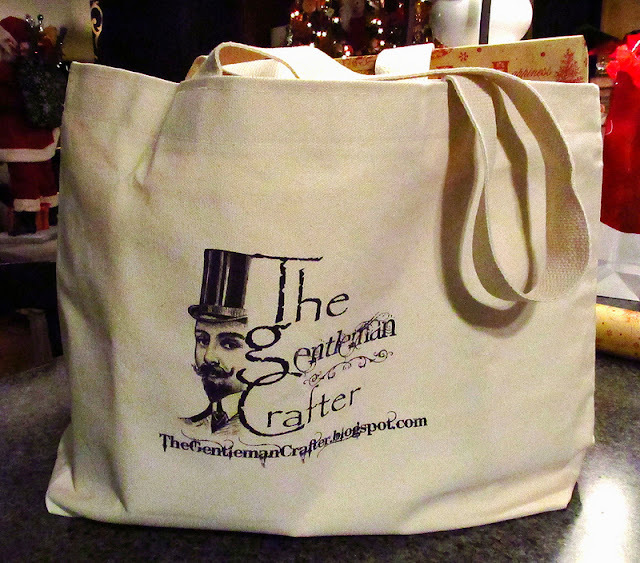 I only have one of these totes to give away, so please be the first one to spot the foundation feet and email me at: TheGentlemanCrafter@gmail.com and I will send it out to you! Good Luck my friends! Thank you all once again for your kindness to me...So Appreciate you! Back to wrapping presents! I found a package of feet! Will e-mail you the picture! Love your lost feet incident. You are not alone. It happens to me all the time. Thanks for the fun! I emailed too... just in case Nan didn't get it right.... ya' never know! I just *knew* you find those missing feet when you'd least expect it! Glad you did! lol.....I found NO feet hahahaha, I guess I am losing it too! Congrats Nan! You're quick! :o) Thanks for the fun Jim! I still have to wrap my presents too.... probably tomorrow afternoon. Have a wonderful weekend with your family! Merry Christmas! Bummer! You might know I was busy wrapping presents and not stalking your blog for a change. I too see the feet, don't feel bad Jim, I'm 53 and it gets worse with age. And I love your bag, can I buy one? I see the feet. We all have those moments.! Hurry and come and set up your projects...I want a new dining room table!!!!! Can't wait for you to be here!!!!! EEEEEEEEEEEEE!!!!!!! Congrats Nan....Whooo Hoooo!!! I found the feet too...as a consolation prize can I purchase one of those bags cause it ROCKS!!!! Good eye and quick on the draw Nan. Congrats. Cooooooooollllllll bag Jim! Too funny, unfortunately as you age, this happens more and more lol, it happens to me quite regularly and what is it with finding them right after you purchase new???! Guess it is a given. Congrats Nan, wonder if your new bag with have feet in it? Very nice bag Jim, great to carry some of your gifts to your fam in this weekend ~ the small ones any way. Merry Christmas and Happy Holydays to you and your lovely family! Glad you got some downtime to kick back a little with special people. I am glad you got your "feet" . Only a crafter would appreciate that! Have a wonderful Christmas! I found them, too, but didn't see the post until now. ROFL. Oh well, it was a fun hunt! I'm sitting here smiling because only other crafters would understand that you are having a lost feet contest. Only another crafter would not think it was strange to sit in a room and hear someone say..."I've lost a foot. Oh no, I cut her arm off... oh sh** I just cut his head off. Boo is so right - we're all smiling. Crafters do get to say the funniest stuff. Way to go Nan! Eagle eye. In retrospect, I'm surprised none of us thought to searh the photo the first time you posted the picture.Lol.I'm hoping to finish rapping and stockings tonight too. Take a plastic tarp with you and your sister won't have a thing to worry about.By the way, you work with three gorgeous ladies! Glad you had fun.Have an awesome weekend and Merry Christmas to all. P.S. Saw a package of feet in Michaels yesterday and couldn't resist the need to buy them. Lol. HA!! I never did find them...looked and looked...so Jimbo...do tell...where are they?? Enjoy your family and come back to us refreshed, relaxed and rejuvenated!! Top left past/ next to the table leg! always good to keep an eye on your feet, Jim! teehee! Oh...I am always a day late and a dollar short. I did see them though. I love the tote!!! You could make a killing selling them and the coffee mugs!!! Heck, I've said all along that Tim could make a killing selling T-shirts. I think you both need to put some T-shirts and sweatshirts out there too!!! Okay ... I know it's late but it was fun to look and see if I could find them to my surprise I found them right away... could that be because I'm a Tim-aholic??!! Thank you for all the joy you bring with your blog and your amazing projects!! Well I can not see those stinking feet! But that's ok, it was fun "looking" through your stash Jim! I wish you a safe and fun filled Holiday! Jim, you're the only person I know who could have a Where's Waldo? with TH goodies! Should we spoil the fun for Becky Ann? Jim, just wanted to stop in to wish you and your family the Happiest of Holidays!!!!! Give Mom a big Christmas Hug as well. Enjoy, and I know you are on Santa's "NICE" list, so I am sure he will be bringing you something extra special!! !